Sierra College and SME Sacramento Valley have partnered to connect schools and businesses for National Manufacturing Day and events throughout the month of October. The goal is to make students aware of STEM education paths that lead to advanced manufacturing careers. There are many opportunities for students to become designers, engineers and fabricators with companies in Placer and Nevada counties. Students enrolled in Career Technical Education courses in high school can further their education at Sierra College earning certificates and degrees. With technical skills, students can secure internships and part-time work with employers to gain practical skills and earn money to pay for their education. By attending tours, students learn more about what local manufacturing firms produce and determine if they can envision themselves working in the environment. They can also gain insight into the hiring process and make connections. Students find it especially interesting to talk directly with employees about their work and see how they use advanced manufacturing techniques on the job. The students often discover that the tools and software they are using in the classroom are directly applicable to the workplace. Businesses can work with faculty members to customize the tour. 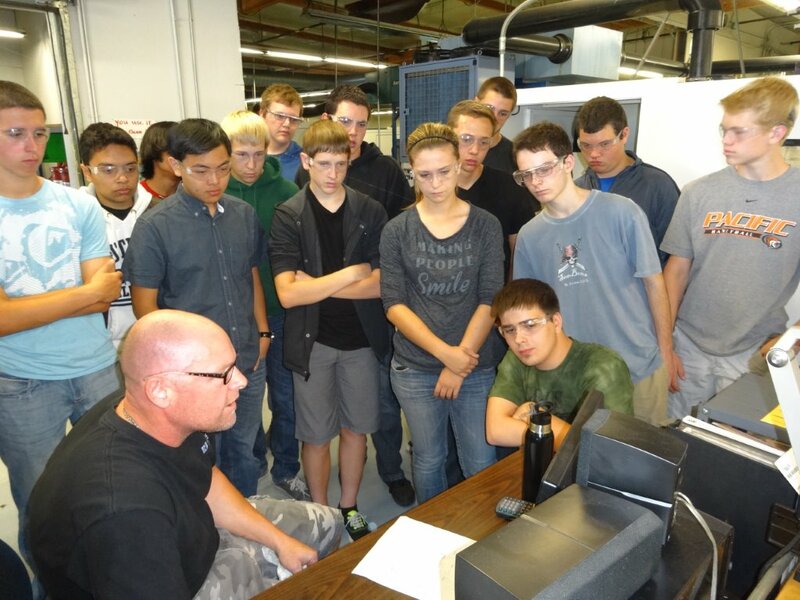 For example, RobbJack, a high-end cutting tool manufacturer located in Lincoln CA, offered a tour to trigonometry students at Colfax High School. Throughout the tour, employees explained how trigonometry was used on the job. The company also developed sample math problems based on real life situations in designing and fabricating tools. To learn more about the 2014 activities in October for National Manufacturing Day, check out the flyer (SME No CA Manufacturing Day Oct 2014 emailweb) developed to invite companies to participate. Teachers can contact Carol Pepper-Kittredge, CACT Director, Sierra College and manager of the Sierra College STEM Collaborative. What happens to high school students who have been in classes taught by instructors who have benefited from the Sierra College STEM Collaborative? In this movie, posted by Colfax math and engineering teacher, Jono Schwartz, hear about a Colfax High School graduate, now a student at Cal Poly, who built his own bike frame as a member of the university frame builders club and plans to work this summer at an internship with Harris & Bruno, in Roseville. These are some of the interesting things Carol Pepper-Kittredge recalls seeing at this year’s Maker Faire held May 17-18 in the San Francisco Bay Area. FeetZ – www.feetz.co or facebook.com/Feetzshoes – 3D printed shoes based on a self-scan of your feet. The shoes were made on a maker-bot style printer and used a soft urethane that, depending on the printing density, could be stiff (for the sole) and flexible (for the upper). This is the first soft material that I’ve seen run in a personal (non-commercial) style printer. Lucy Beard (CEO) had worn her shoes for 3 months and they looked good. Visualizer – https://getvisualizer.com/ A software that translates images from your phone to Sketch Up. Camera Sculptura – http://www.camerasculptura.com/ A multi-camera booth and photo translation software to make 3D images of the human body. Curious Customs – http://curiouscustoms.com/ Laser cut lanterns and night lights. These reminded me of a previous Maker Fair where Adobe had a photo booth and used images to make similar lanterns out of cardboard. These products were flying off the shelf. Taktia – http://taktia.com/ A software and CNC-enhanced router system to make very precise but human-controlled fabricated parts. This product is incredible – I want one now. Avava Systems – http://avava.magnuslabs.com/ modular, zero waste building system. 3D Robotics – http://3drobotics.com/ Lots and lots of drones this year. This was one of the companies there. Q Fusion – http://survey.qfusionlabs.com/qfusion/index.php A start up, they are developing a competitive alternative to the Arduino that has a GUI interface and appeals to those who don’t want to learn programming language. Sound Cloud – https://soundcloud.com/ Share your music with the world. Trash Amps – http://www.trashamps.com/Default.asp For those interested is sustainability. Sold in kits and completed units. Part Fusion – http://partfusion.com/ There were so many more wearable electronics this year, and some were really interesting. I saw an LED vest that was programmed with moving images, clothes with ‘cool LED’ sewn in, etc. 3-DIY – http://3-diy.com/ Another new trend, DIY 3D via your phone, etc. Another start-up, Poppy (poppy3d.com) is pretty cool – works with an iPhone – I’m going to order a couple. Bootstrap Solar – http://www.bootstrapsolar.com/ Low cost solar charger system (for back country use). Be3DPrinters – http://be3dprinters.com/us/ A competitor to MakerBot, etc. this is a sleek looking model running PLA. The price point was much lower than the MakerBot. MCU Gear – http://mcugear.com/en/ A modular microcontroller system – no wiring. The inventor (all the way from Tokyo) has stacked up to 100 boards in one configuration. All are Bluetooth enabled. Emmett Lalish – who works for Microsoft – http://www.thingiverse.com/emmett/overview We were chatting with this guy as he was showing us his amazing 3D printed designs made on a PLA printer (available on Thingiverse) when some students showed up and said “are you Emmett?” When he answered yes – they let out a loud shout, so I had to ask “Are you famous?” to which his colleague nodded yes. Check out his design products – unbelievable and fully available. The Blossoming Lamp is printed in one piece, and yet it is fully articulated. The other toys are printed in pieces and snap together. Sierra College is partnering with Sacramento Hacker Lab to encourage innovation in the greater Sacramento region. 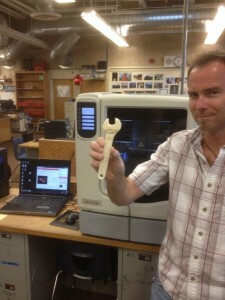 Learn more at Sierra College CACT & Hacker Lab Partnership & 3D Printer Spur Innovation. 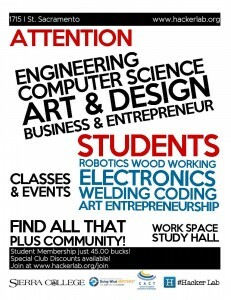 Student clubs can arrange special discounts to join Hacker Lab. Sierra College Center for Applied Competitive Technology (CACT) also supplied a 3D printer and soldering equipment to Hacker Lab so members are able to use this equipment to develop new products. Sacramento Hacker Lab will host a 32 hour competition on Feb 8 — Cereal Hack. The on-site 3D printer provided by Sierra College CACT will be available to teams to use during Cereal Hack. Sierra College STEM Collaborative recently provided 3D printers to Colfax, Del Oro and Placer High Schools to introduce Career Technical Education students to Product Design and Advanced Manufacturing careers. See the new 3D printer at Del Oro High School. According to a report on CNBC Disruptor Series on Manufacturing Disruptors, exponential growth is expected in 3D printing and robotics. Learn about community-based product development in second report on Quirky. Learn more about 3D printing from the Additive Manufacturing Turning Mind into Matter — Industry Evaluation and Recommendations Report, published by Sierra College Center for Applied Competitive Technologies (CACT). The paper is intended to help both businesses and educators learn more about emerging Additive Manufacturing technologies. Colfax High School students who benefited from the freshmen Tech Essentials course supported by Sierra College STEM, recently made these STEM interview movies as sophomores. Thanks to Wade Wolff who guided these students in producing this project. The interviews with teachers, counselors and the principal describe the impact that the Sierra STEM Collaborative has had at Colfax High School. Click the links below to see the four movies on the Colfax You Tube ColfaxMultimedia Channel. Tech Essentials Team – The Colfax High School Tech Essentials teaching team talks about the positive impact the Sierra STEM Collaborative partnership. The support made it possible to create a Tech Essentials program and curriculum for freshmen. That model is now being used through the Placer Union High School District. 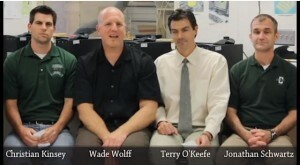 Principal – Principal Rick Spears talks about the Sierra College STEM Collaborative and the CTE program at Colfax High. Teachers have benefited from collaboration time, professional development and cutting edge tools. As a result, all Colfax students are being exposed to STEM Curriculum and opportunities after high school. Career College Counselor – Career College counselor Bobbi Jo Forsyth talks about how the Career Cruising program, supplied by Sierra College STEM Collaborative, is helping her do her job at Colfax High School and attract students, especially girls, to Science, Technology, Engineering & Math. Counselor – Counselor Rachel Dalton talks about using the Career Cruising program at Colfax High School. Students start using it as freshmen and can use it throughout high school to explore careers, discover their interests, research colleges and make career plans. The students who made these movies gained valuable skills from the Tech Essentials course that all freshmen take at Colfax High School to learn applied academics. The course taught them to teamwork, project management and documentation as well as provided an introduction to Career Technical Education courses covering engineering, metal fabrication, woodworking, electronics, multi-media and photography. Sierra STEM provides support to the teacher team that created this Tech Essentials course and has supplied equipment to bring the design and innovation labs up to date. Edutopia recently released an article on 6 Strategies for Funding a Makerspace. Recommendations include: Find a space, start a club, get sponsors, seek grants, fund raise online and start a campaign. The article includes examples from California schools that have created Maker Spaces.